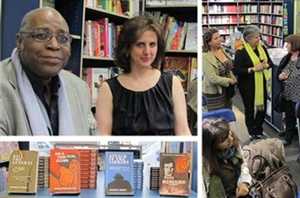 The presentation CRIME FICTION SERIES: ROMANIAN NOIR, held by Profusion Publishers at Belgravia Books (www.belgraviabooks.com) on 30 April 2013, was part of a series of events dedicated to crime writing from around the world. Placed in between the presentations of Italian (Hersilia Press) and Latin-American (Bitter Lemon Press) crime literature, Romanian Noir attracted a public interested by the evolution of this literary genre in Eastern European countries. Profusion Crime is the first series of Romanian crime books translated into English, and it features novels by George Arion, Bogdan Hrib and Oana Stoica-Mujea. The series also contains a non-fiction book by Mike Phillips and Stejarel Olaru. The evening started with a brief history of the evolution of this literary genre in Romania, made by Ramona Mitrica. The presentation was in reverse chronological order, starting from recent volumes of genre authors: George Arion (Andrei Mladin series), Stelian Turlea (between thriller and fairytale), Bogdan Teodorescu (political thriller), Bogdan Hrib (Stelian Munteanu series), Oana Stoica-Mujea (Iolanda Stireanu series), Lucia Verona, Monica Ramirez, Ivona Boitan, Andrei Onciu, Emil Simionescu, Alex Mihalcea, VT Morogan, Mircea Pricajan, Andra Pavel, Renata Carageani, Denis Grigorescu, Daniel Sur etc. There followed a short presentation of some of the most prolific crime authors from the communist period, some of whom also continued to write successfully after 1989: Rodica Ojog-Brasoveanu (two series featuring Minerva Tutovan and Melania Lupu, respectively), Petre Salcudeanu (“Bunicul” – The Grandfather series), Haralamb Zinca, Leonida Neamtu, Horia Tecuceanu, Theodor Constantin. The audience wanted to find out more about the constrictions imposed by censorship at the time, about the subjects these authors approached, about the influence of numerous translations from international – especially after 1970 (Edgar Wallace, Agatha Christie, Conan Doyle, Raymond Chandler, James Hadley Chase, Dashiel Hammet), and about the circulation of ideas in the genre literature of Central and Eastern Europe. The presentation also discussed the reticent beginnings of this genre in Romania, under the influence of the popular novels at the end of the 19th century (Panait Macri, Nicolae D. Popescu). Also mentioned were the few contributions to the crime genre, made during the interwar period, by writers established in other literary genres, such as Cezar Petrescu (Baletul mecanic – The Mechanical Ballet), Victor Eftimiu (Kimonoul instelat – The Starry Kimono) and Liviu Rebreanu (Amandoi – Both). After this, Mike Phillips made a general presentation of crime writing in the United Kingdom and the US, from its birth to the present day, stressing the various themes and styles used by the numerous authors of this genre. A crime writer himself (the Sam Dean series), Mike Phillips talked from his own experience about the popularity and the role played by the ‘consumer-oriented’ literature in the UK, also about the importance of popular culture in the contemporary British society. “In the contemporary culture of the UK we are no longer talking – as they do in Romania – about such a strict border between the so-called 'high’ cultural forms, and the 'popular’ ones,” said Mike Phillips. The last part of the evening was exclusively dedicated to the Profusion authors, whose portraits were sketched by Mike Phillips, reading from the English translations of the novels Attack in the Library (Atac in biblioteca by George Arion), Kill the General (Ucideti generalul by Bogdan Hrib) and Anatomical Clues (Indicii anatomice by Oana Stoca-Mujea). In the end, Mike Phillips read from his own book, Rimaru – Butcher of Bucharest (Rimaru – Macelarul Bucurestiului), written in collaboration with the Romanian historian Stejarel Olaru. The presentation Romanian Noir is part of a campaign promoting the series of novels translated from the Romanian, and published by London-based Profusion Publishers. Similar presentations took place in the past year in London, Leeds and Edinburgh. The publishing house will continue to translate and publish crime writing from Romania, while also planning to navigate towards other literary genres. Belgravia Books, o cochetă librărie independentă, deschisă recent în celebrul cartier Belgravia din centrul Londrei, i-a invitat pe editorii Ramona Mitrică şi Mike Phillips să facă o prezentare de ansamblu a prozei de tip thriller din Romania, exemplificând prin lecturi din cărţile deja traduse şi publicate de ei in limba engleză, prin intermediul Profusion Publishers (www.profusion.org.uk), o editură britanică independentă. Prezentarea CRIME FICTION SERIES: ROMANIAN NOIR, susţinută de Editura Profusion la Librăria Belgravia (www.belgraviabooks.com) pe 30 aprilie 2013, s-a înscris în seria evenimentelor dedicate literaturii de tip thriller din diferite părţi ale lumii. Plasată între prezentarea literaturii thriller italiene (Editura Hersilia) şi a celei latino-americane (Editura Bitter Lemon), Romanian Noir a atras un public interesat de evoluţia acestui gen literar în ţările din Estul Europei. Profusion Crime este prima serie de cărţi poliţiste româneşti traduse în limba engleză şi conţine romane de George Arion, Bogdan Hrib şi Oana Stoica-Mujea. Seria conţine şi o carte de non-ficţiune scrisă de Mike Phillips şi Stejărel Olaru.